“I want you to teach me how to be fabulous,” pleads Macaulay Culkin inhabiting the role of infamous club kid Michael Alig in 2003’s cheeseball Party Monster. In response, Seth Green’s James St. James spits back, “We have nothing in common,” picks up his metal lunchbox/purse, and changes his mind, quoting William Blake: “The road to excess leads to the palace of wisdom.” Parading through the Pepto-Bismol pink donut shop, St. James sends Alig down a rabbit hole of fabulousness. Of course, there are no rules for being fabulous, except for maybe that fabulousness has no rules. Nor should it. The irony of this scene in Party Monster is that in the film’s Hollywood version of New York’s club scene, neither Alig nor St. James come off as particularly fabulous, as they stroll around the exhausted, carbo-loading patrons. This isn’t to say the actual club kids didn’t achieve fabulousness–just watch any number of trashy talk show appearances by Leigh Bowery, RuPaul or Amanda Lepore in the 1990s to see how their creatively eccentric extravagance both shocked and inspired Middle America. But, fabulousness, as perfected by the self-fashioned performances of queers, people of color, gender non-conforming folks and other marginalized communities, slyly and subversively worked its way into the mainstream before. Take, for example, the queen of disco Sylvester’s music video for “You Make Me Feel (Mighty Real).” After enduring some cringe-worthy thrusting (dancing?) by some gym clothes-sporting performers, Sylvester appears, strolling down a staircase in all black with a face full of golden-hued eyeshadow and bronzy lipstick. If that weren’t enough, he disappears and returns in a dapper white suit and a matching ivory fan, only to enact another wardrobe-change soon after, in a sequined muumuu. If you aren’t screaming and searching for how to purchase your own fan to flap around on the subway, then I don’t know what to tell you. Sylvester, in “You Make Me Feel (Mighty Real),” as well as in other songs like “Stars,” in which he proclaims: “You are a star, everybody is one,” is a vision of queer Black femme pride. And he brought this unwavering dedication to sequins, glitter and glamour into the homes of America with this gold record. Talk about transgression–Sylvester’s fearless style, in the face of a society that would deny, silence and delegitimize his experience, is an undeniably political gesture. Fabulous: The Rise of the Beautiful Eccentric isn’t a history of fabulousness, at least not one in any traditional sense, though it does give space to fabulous elders like Prince. A history of fabulousness, as moore deftly explains, would be near impossible due to the gaps in histories and archives of particularly queer people, people of color and other marginalized communities. “There is no centralized physical archive of fabulousness, no major author, no all-in-one site to see and study it because it is a quality that moves across time, media, and space. That is why this book is not a history of fabulousness, but a theory of fabulousness as a form of creativity from the margins,” he says. By focusing on a theory rather than a history, moore allows for a critical discussion about what exactly fabulousness is, what a look does, and what is at stake in this sequin and feather-drenched aesthetic. While training a serious critical eye on fabulousness, Fabulous: The Rise of the Beautiful Eccentric isn’t your average academic read. It’s a page turner without losing any theoretical or political rigor. While the book is grounded in other critical texts, including my personal bible Fiona Buckland’s Impossible Dance: Club Culture and Queer World-making, which makes moore one of the only scholars I’ve ever seen cite her book, moore flawlessly combines theory, personal narrative and interviews with performers and others who engage with fierceness and fabulousness. In this, it’s perhaps more akin to newer academic books like Victor Corona’s Night Class than stodgy, jargon-heavy theory. And thank god–who wants to read stilted institutional argle-bargle about fabulousness?! It’s impossible not to recognize that the book is a very personal project for moore. Take, for instance, his final chapter on Prince, which powerfully poses Prince as a role model figure for moore, particularly as a queer child. Pointing out how fabulousness provided both an escape and an answer for when he felt as if he was a “black queer error,” moore’s investment in fabulousness goes beyond mere academic interest, which gives the book an additional layer of poignancy. While not a history per se, moore has certainly done his share of research. This proves that while fabulousness harnesses fantasy and has more than its share of utopian ideals, that doesn’t mean it’s not enacted in real time in everyday life. moore cites performers including violinist Amadéus Leopold, as well as those who upload their fabulousness onto social media like Apichet “Madaew Fashionista” Atirattana, a teenager from Thailand’s Khon Kaen province who constructs incredible outfits made out of chicken wire, cabbage leaves and even, toilet paper. This isn’t a cursory look at fabulous based on who has been previously approved by the arts and performance worlds. moore also spends time diving into both club and house ball culture as prime locales where the performance of fabulousness thrives. Interviews with performers and artists such as Alok Vaid-Menon, Shaun J. Wright and Lasseindra Ninja, wedged in between longer chapters, help to cement moore’s research and theoretical writing on queer world-making into reality. He even speaks to a Black female adjunct professor who has been told told to tone down her fierce look by colleagues. Isn’t academia lovely? As moore writes, it’s “an unsubtle suggestion that blackness, wherever it appears, always presents a surplus, an excess that needs to be tamed. But instead of allowing excess to be suppressed and placed under punitive surveillance, she has used to it create space for herself on her own terms.” While moore provides many examples in mainly the performance world, his theory of fabulousness could easily be applied to numerous forms of creative expression including visual art, particularly in the paintings of artists like Devan Shimoyama and Mickalene Thomas. However, the main thrust, and for me the most moving part, of the book is moore’s assertion that fabulousness is “a form of protest, a revolt against the norms and systems that oppress and torture us all every day, things like white supremacy, misogyny, transmisogyny, patriarchy, toxic masculinity, gender policing and racism.” Style, like nightlife, is often not taken seriously as something that can have political resonance. But, particularly for queers, people of color and other marginalized folks, not hiding when you simply walk out the door in the morning, not to mention sporting an over-the-top look, is inherently resistant. Asserting visibility in a society that would rather you be invisible is, at its heart, a political act. As moore says, “Style is political, a theory of a poetic self. More than anything, fabulousness is political glitter–a glitter-bomb through everyday life” (45). But even though fabulousness can be revolutionary, that doesn’t mean it lasts forever. 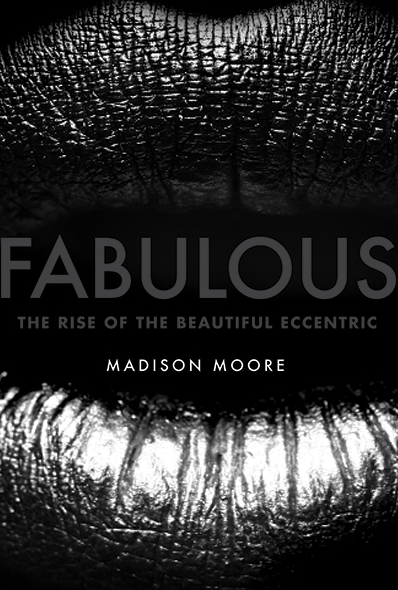 Fabulousness is fleeting–a momentary glimpse at alternate worlds embodied in the present. moore perhaps best engages with the short-term aspect of fabulousness when exploring nightlife. He poses nightlife as “a portal, a door or a teleportation to another universe that we slip through to access other sides of ourselves and other heightened states of being?” (149). But, eventually, after those harsh and horrible lights of last call come up, it’s time to return to, as bell hooks termed, the white supremacist capitalist patriarchy. However, this doesn’t mean the fabulousness attained in nightlife just vanishes. “But nightlife always leaves a trace–a memory, a story, a bar stamp, a creative idea,” moore explains, “and these traces can help us think about the kinds of things we bring back with us from our nightlife experiences. How are we changed once we cross back through the portal to the other side? The portal is the enabling device that creates the stories we tell and it helps us experience things we wouldn’t normally see. Once on the other side we are opened up to new, unexpected narratives. We come down and we come back, but through the experience we are always changed in some way” (153). In this way, fabulousness is a lot like glitter–it sticks with you afterward. While fabulousness, like the communal experiences of nightlife, may be temporary, that glitter is hard to fully take off. You often find yourself discovering flecks of sheen here and there well after the fact, acting as reminders of fabulous utopian possibilities attained for even an instant. Tags: Alok Vaid-Menon, Amadéus Leopold, book review, Books, fabulous, Fabulous: The Rise Of The Beautiful Eccentric, fabulousness, Fiona Buckland, Impossible Dance, Lasseindra Ninja, Madaew, Madison Moore, nightlife, Party Monster, Prince, Shaun J. Wright, Sylvester. Bookmark the permalink. Previous post ← What The Hell Is With This Disco-themed Political Attack Ad?